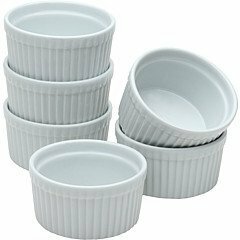 Set of 12 6 ounce ramekings are perfect for ingredient preparation, creme brule and condiment serving. BIA Cordon Bleu products are crafted from porcelain which is beautiful and sturdy at the same time. These pieces are dishwasher, oven, microwave and freezer safe. Porcelain is chip resistant and won't transfer tastes or colors.